The Island of Cuba. The 500-year-old City of Havana was built 30 years after Christopher Columbus found the island and the New Land of North America. 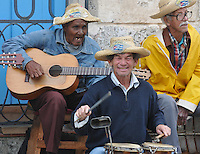 Last bastion of Communism and Socialism with a Hispanic flavor, it is soon to open up to U.S. tourism. Much will change within as the 50-year embargo is lifted and new goods find their way on to the island. Everything will change. These pictures capture a happy people who do not feel sorry for themselves, but rather are survivors who have learned to live within the framework of a government that believes "revolutionary vigilance is everyone's job" while the underlying premise of many of its citizens is "they pretend to pay us and we pretend to work."